SCCM-The Request Failed with HTTP Status 503: Service Unavailable. After deploying SCCM 1710, all my SCCM clients did not download any software updates from my distribution point. WSUS was configured using the best practices but no software updates appeared in the software center. 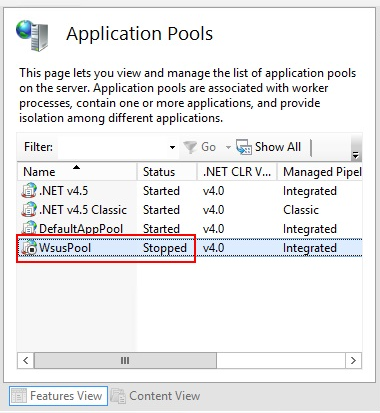 After checking the IIS settings, I noticed that the WsusPool Application Pool in IIS was in a stopped state. You just need to start the Application Pool and wait a few minutes until SCCM clients download software updates. Remember to increase the Private Memory Limit (KB) for the Application Pool. Depending your SCCM server, you must at least increase to 4000000 KB.